Scolopendra morsitans, copyright Jiri Lochman/Lochman Transparencies. It was a dark night, but not stormy (nights tend to be dark, as a rule). We were out collecting for our regular survey when we encountered a large centipede (the same species as in the photo above) crossing the road, and decided to add it to our collection. Taking out the large 20-cm forceps that we had on hand for dealing with venomous animals, one of us used them to grab the centipede. The response was electric. 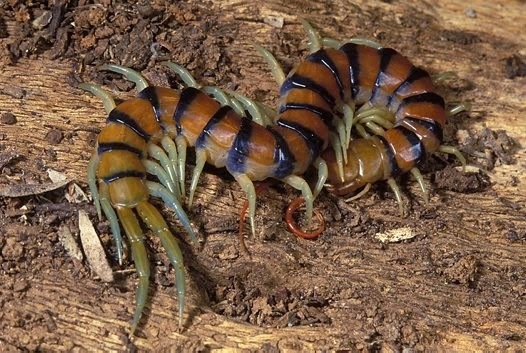 Rather than trying to escape its attacker, the centipede instantly whipped back and lashed itself around the forceps, doing its best to bite into them. Had the actual wielder of the forceps been within its reach, they would have been in for a world of pain. When dealing with scolopendrid centipedes, you should always remember three things: they are big, they are fast, and they are mean. But lest you think that scolopendrids are all venom and viciousness, let me point out that they also have their endearing qualities. Female scolopendrids make devoted mothers, coiling around their egg clutches and regularly cleaning them to prevent fungal attack. Even after the eggs hatch, the female continues to coddle and groom her young. Brunhuber (1970) recorded that females of Cormocephalus anceps spent at least three months (from late September to late December) caring for young before they struck out on their own. Even after becoming independent, the young do not reach sexual maturity until they are at least two years old. 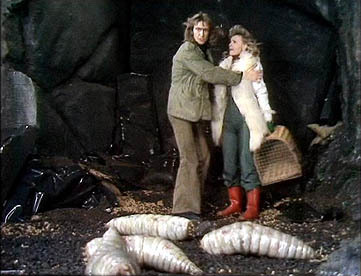 Other scolopendrids may mature more quickly, at about one year (Lewis 1972). 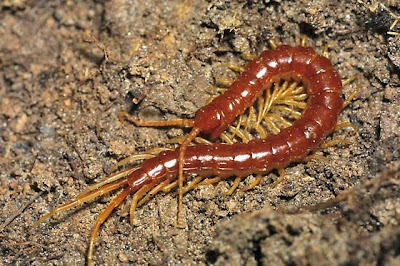 Individual centipedes may live for several years. Female Scolopendra morsitans cleaning her eggs, copyright H. J. B.. The Scolopendridae belong to a larger centipede group called the Scolopendromorpha. Most scolopendromorphs have bodies with 21 or 23 leg-bearing segments, except for one remarkable scolopendrid species from central Brazil that has 39 or 43 leg-bearing segments (Chagas-Junior et al. 2008). Non-scolopendrid species are often much smaller than the Scolopendridae, with some being only about 10 mm in length. These smaller scolopendromorphs also differ in eye morphology: Scolopendridae have a patch of four ocelli on either side of the head, but other scolopendromorphs are mostly blind and lack ocelli. In the past the blind scolopendromorphs have been treated as a single family Cryptopidae, but recent authors have mostly recognised three separate families Cryptopidae, Scolopocryptopidae and Plutoniumidae in light of uncertainty about the monophyly of a broader Cryptopidae. Nevertheless, a recent phylogenetic analysis by Vahtera et al. 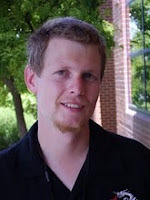 (2012) combining both morphological and molecular data did support a single blind clade. Unfortunately, no phylogenetic analysis to date has been able to include Mimops orientalis, an odd scolopendromorph known from a single specimen collected in China in 1903 and placed by Lewis (2006) in its own distinct family. Mimops possesses but a single ocellus on either side of the head, potentially making it very intriguing for the question of whether blindness has evolved in scolopendromorphs more than once. The blind scolopendromorph Scolopocryptops sexspinosus, copyright Troy Bartlett. Brunhuber, B. S. 1970. Egg laying, maternal care and development of young in the scolopendromorph centipede, Cormocephalus anceps anceps Porat. Zoological Journal of the Linnean Society 49 (3): 225-234. Bush, S. P., B. O. King, R. L. Norris & S. A. Stockwell. 2001. 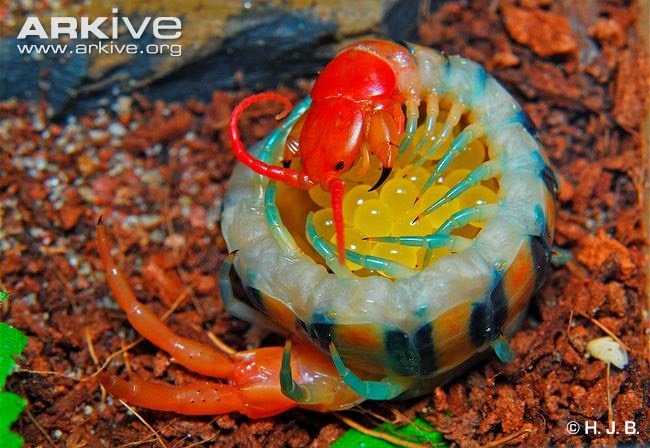 Centipede envenomation. Wilderness and Environmental Medicine 12 (2): 93-99. Chagas-Junior, A., G. D. Edgecombe & A. Minelli. 2008. Variability in trunk segmentation in the centipede order Scolopendromorpha: a remarkable new species of Scolopendropsis Brandt (Chilopoda: Scolopendridae) from Brazil. Zootaxa 1888: 36-46. Lewis, J. G. E. 1972. The life histories and distribution of the centipedes Rhysida nuda togoensis and Ethmostigmus trigonopodus (Scolopendromorpha: Scolopendridae) in Nigeria. Journal of Zoology 167 (4): 399-414. Lewis, J. G. E. 2006. On the scolopendromorph centipede genus Mimops Kraepelin, 1903, with a description of a new family (Chilopoda: Scolopendromorpha). Journal of Natural History 40 (19-20): 1231-1239. Vahtera, V., G. D. Edgecombe & G. Giribet. 2012. Evolution of blindness in scolopendromorph centipedes (Chilopoda: Scolopendromorpha): insight from an expanded sampling of molecular data. Cladistics 28: 4-20.